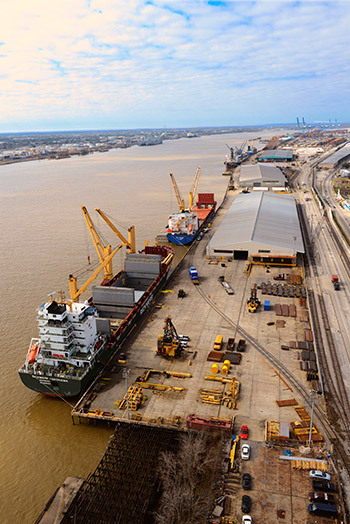 Coastal Cargo Company operates the Louisiana Avenue complex, which is one of the largest break-bulk terminal operations in the Port of New Orleans, at Mile 95 on the Mississippi River. The complex consists of the Louisiana Avenue Wharf, the Harmony Street Wharf, and the Seventh Street Wharf. The facility provides approximately a mile length of berthing space, enabling Coastal to handle multiple vessels at one time. Coastal Cargo utilizes at Louisiana Avenue experienced non-union labor allowing us to offer the utmost flexibility in meeting customer requirements. For more information on CCLA contact (504) 587-1200 or request a quote by completing the quote request.